For the longest time my linen closet was an absolute disaster zone. The door needed to be opened slowly because sheets and towels would most likely just fall right out. That was until I learned how to organize my linen closet. I have tried fancy folding, rolling, and any number of things to try to organize my linen closet. It wasn’t until one day, a few years ago, when I was trying to shove just one last towel into my linen closet and half the towels came tumbling off the shelf that I realized I had a linen closet organization problem. I looked at my closet and wondered why my paper towels were stored there when we had a perfectly good laundry room. Finally, I looked at the bedding shelf and wondered why I had four sets of bedding, some mismatched when I only ever had two that I used. It was in this moment that I finally got some clarity about my overcrowded linen closet situation. I set out to figure out the best way to organize my linen closet too. What came from this project was the ability to organize my bath products in any linen closet – or even the lack of. Related Post: How To Organize Your Bathroom Without A Linen Closet. Before you start trying to fancy fold towels to make more space take a look at what you actually need that’s in your linen closet. Your typical linen closet will have loads of towels, hand towels, and washcloths. There will be sheet sets and pillow cases galore. Then finally you’ll have first aid products, toiletries, and medicine. So this tiny closet can get cramped and cluttered quickly. First thing you want to do is go through all the things in your closet and see what can be donated, trashed, moved to a different location and what to keep. I do recommend that you keep as many kitchen towels, washcloths, and rags as you want – only because these really come in handy. After you declutter your closet you can start the organization process. Some things will stay in the closet while other stuff will end up going elsewhere. These are the products I recommend to keep your linen closet and bathroom organized and free from clutter. Check out my post 5 Products To Kill Kitchen Clutter. The first step to having an organized and clean linen closet is to have organized sheets. We all know how difficult folding fitted sheets can be so I searched through YouTube until I found the easiest sheet folding video I could find. This is exactly how I fold my fitted sheets, it’s by far the easiest and most efficient way to fold fitted sheets. I was about 32 years old when I finally figured out how to fold fitted sheets this way and it’s been a game changer. Now that you have your fitted sheets folded, fold your flat sheets. For each set of sheets you will want to leave one regular size pillow case unfolded. Fold the other pillowcase and stack your sheets in the order of fitted, flat, and finally matching pillow cases. Take the stack of sheets and place them inside the one unfolded pillow case. Now that you have your sheets, folded and organized you can stack them for easy storage in one or two piles depending on how many sets you have. Check out my post How To Downsize and Live Small. There are a lot of ways to fold towels. I personally prefer folding to stack because the folding process is easier. I simply fold in half, half, and thirds. If you want to save more space you can roll your towels like in the video below. Roll both bath towels and hand towels. Fold your washcloths in half and then in half again for easy stacking. Hopefully you’ll now be able to put all your towels on one shelf. This is dependent on how small or large your linen closet is. Now that all your sheets and towels are folded correctly let’s start organizing those shelves for easiest access. First, organize your medicine box or basket. Put all the medicine in this box and free up space in your bathroom or kitchen cabinets. Make sure you have discarded all old or expired medicine. This can go on the very top shelf of your linen closet or on a shelf situated above your bathroom door. On the 2nd shelf down stack your fitted sheet, flat sheets, and pillow cases. Extra blankets and comforters should go into a trunk or tote and stored away. I personally prefer putting the sheet sets in the corresponding room either in a night stand on a shelf inside a bedroom closet. One the next shelf you’ll put all your towels. Place the rolls or stacks of bath towels on one side, your hand towels on the other, then your washcloths in the middle. Check out my post 9 Tips For Spring Cleaning. The linen closet is the best place to store extra bathroom needs like tooth brushes, toothpaste, and other things. I prefer storing toilet paper in the bathroom itself and paper towels near the kitchen, in a coat closet, or in the laundry room if it’s on the first floor. If you prefer to save room in your bathroom make sure you stock it with a few extra rolls of toilet paper in a cabinet or on a shelf. The rest of the toilet paper stays in it’s packaging on the floor of the linen closet. Even if you have an extremely tiny linen closet using the folding tricks above will help to keep your closet organized. You can take advantage of door space by securing hanging baskets to the door to hold extra washcloths or stock products. Check out my post The Efficient Cleaning Schedule The Works. I currently have super tiny linen closets – like built in between studs linen closets. I can literally only store washcloths, hand towels, and a few odds and ends for bath products. With some of these tricks I’ve been able to manage my typical linen closet products and organize my bathrooms. I don’t have crumbled balls of fitted sheets, too many towels to count, or paper products in inconvenient places either. Remember, when you go through to organize things consider where things would make the most sense to be stored and where they can be conveniently located. Do you have linen closet magic tricks? Let me know in the comments below. 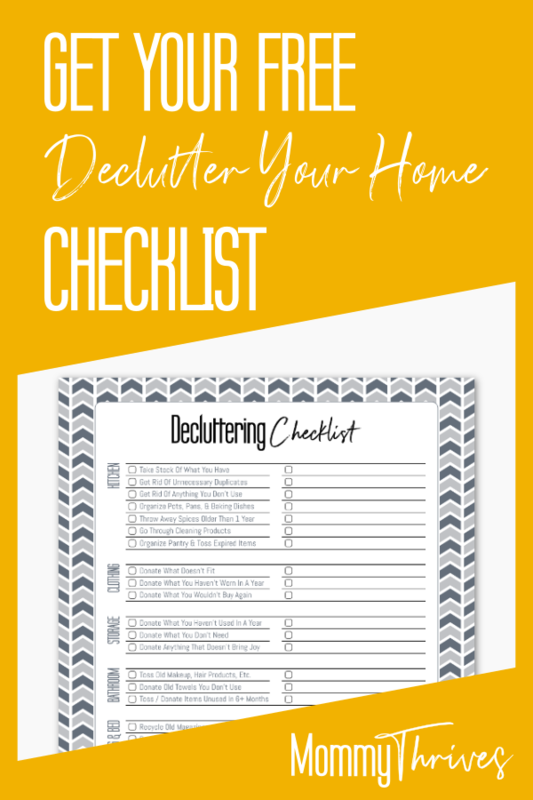 Follow me on Pinterest for more like this and pin this to your organizing and cleaning boards.